Rogar lets you display your cooking utensils, pans, or just tidy up a room with a bar rack. 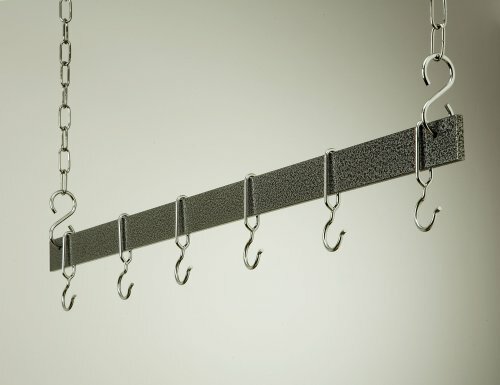 Features: -Comes with 8 hooks -Overall Dimensions: 30" W x 2" D (Black Powder Coated Finish) About Rogar, Rogar was founded in Abilene, Texas in 1975. The goal then, as now, was to design, manufacture and market top quality products. By focusing on fine craftsmanship, unique products and innovative packaging, Rogar has become a leader in the sales of antique-style wine openers, hanging and wall-mounted pot racks and other fine products. All Rogar products are proudly crafted in Virginia, USA, and carry a one-year limited warranty. Black rectangular potrack measures 30" x 15" with a centerbar measuring 30". 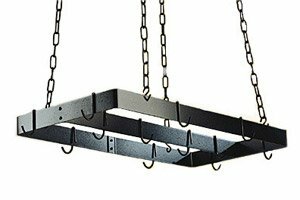 Pot rack includes 12 black regular pot rack hooks and black "S" hooks and chains for mounting. 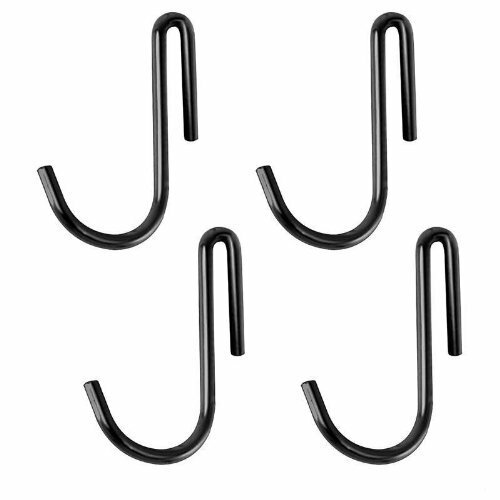 9010 Color: Black Features: -4 Pot Rack Hooks -For use with pot racks in Rogar's Gourmet line -Opening is 1/2'' wide About Rogar Rogar was founded in Abilene, Texas in 1975. The goal then, as now, was to design, manufacture and market top quality products. By focusing on fine craftsmanship, unique products and innovative packaging, Rogar has become a leader in the sales of antique-style wine openers, hanging and wall-mounted pot racks and other fine products. All Rogar products are proudly crafted in Virginia, USA, and carry a one-year limited warranty. Made of Steel. Hammered Copper finish. Rack is perfect over a kitchen island. Puts cookware and utensils at hand. Each rack comes w 2 pieces of 18 in. plated chain. Special design ensures hooks won't slide off bar. Powder coated Steel in 36 in., 42 in., 48 in. and 54 in. L. Includes 6 Copper Hooks. 36 in. L x 2 in. H (10 lbs.). 42 in. L x 2 in. H (11 lbs.). 48 in. L x 2 in. H (12 lbs.). 54 in. L x 2 in. H (13 lbs.). Space-saving silver bar rack with hanging hooks. Choose your size (based on availability). Chain length is 18 inches for hanging options. Small measures 36L x 2W inches and has 6 hooks. Medium measures 42L x 2W inches and has 6 hooks. Large measures 48L x 2W inches and has 8 hooks. Extra large measures 54L x 2W inches and has 8 hooks. No assembly is required. 1 year limited warranty. 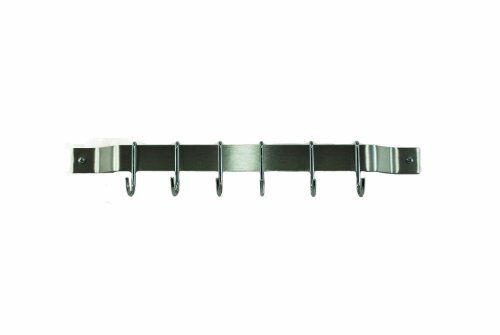 This 18" bar rack is stainless steel and includes 6 chrome hooks. This perfectly designed bar rack hangs kitchen utensils and other everyday items. Rogar manufactures this high quality wall mounted rack that is made of 1/8" thick steel right here in the USA. These bar racks look great in any kitchen and help keep the kitchen organized. Purchase additional hooks to maximize your storage space. 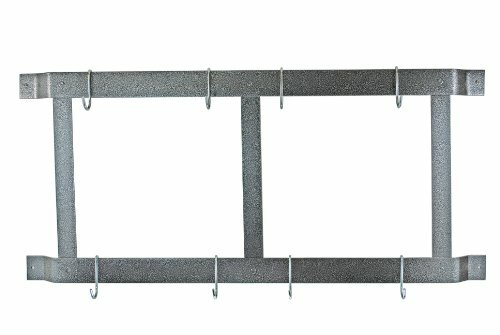 The Rogar 24 Inch bar rack is great for hanging pots, pans and utensils from. This wall mounted rack frees up cabinet space and allows for easy access to everyday items. Looking for more Rogar Pot similar ideas? Try to explore these searches: Black Buckskin, Champion Duffel Bag, and Turtle Lawn Ornaments. Look at latest related video about Rogar Pot. Shopwizion.com is the smartest way for online shopping: compare prices of leading online shops for best deals around the web. Don't miss TOP Rogar Pot deals, updated daily.